Visiting Sydney? 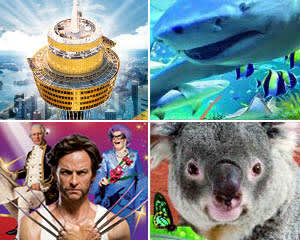 Ensure your time in Sydney is unforgettable with the great value Combination 2 Pass. Visit two of Sydney's top attractions once for one amazing price. The more you see the more you save. Choose from seeing koalas and kangaroos, plus one of the world’s largest crocodiles; walk underwater amongst sharks, experience the best views of Sydney and interact with the world’s most famous figures. The pass is valid for 30 days from the time you enter the first attraction. Once you've entered your first attraction, you've got 1 month to visit the remaining attraction on the pass, so you don't have to visit them both in one day! Note that you must book the date of your first visit with Adrenaline on 1300 791 793 - once you've entered your first attraction, you've got a month to visit the remaining attraction on the pass, so you don't have to visit them both in one day.